Please read my blog for a nightly recap of Fire in the Triad posts to stay in the loop. You can also follow me on twitter @niksnacks and the hashtag #CompDiningNC for live updates during each battle (dinner begins at 7pm). Please also follow Competition Dining on Facebook or the web. Do you know how when you're listening to the radio and you hear a song you've not heard before, but you instantly know it's from your favorite band/group/singer just because they have a familiar sound that travels throughout their body of work? That is how I felt last night during dinner. I don't make it a secret that Spring House is my favorite restaurant in Winston. I've eaten so much of Chef Tim's food, I thought I had a good idea of which dishes were inspired by him. The feta, courtesy of Hillsborough Cheese Co. and the goat cheese, courtesy of Goat Lady Dairy Farm, helped bring this installment of Fire in the Triad to a higher level of sophistication. Each course each night has been creative, elegant and of good quality and intricacy, but tonight's food was by far and away the best food yet. Beautiful and with an appetizing aroma (this course had the best aroma of all the courses), this was most of my table's favorite course. If all of the courses were going to be this good, we knew we were in trouble. The fritter was crispy on the outside and soft on the inside with a light flavor of goat cheese and succulent kernels of corn with soft, crumbled feta that complemented the crispy exterior. Underneath the fritter was the amazing, smoky, spicy bacon jam. Full of flavor, bits of onion and spice, I rolled my potatoes (which were cooked all the way through. Yay!) in it and became sad when there was no more on my plate. The second course was not my favorite, but it was mostly tasty. The pimiento goat cheese, basil, sundried tomato, feta & almond salad were all VERY flavorful and VERY mixed up, sitting atop the fried tomato. I could barely tell when one ended and the other began. On a positive note, I'd never had a fried red tomato before and I look forward to having one again. Lamb is one of my favorite meats. I love it when it's browned on the outside, juicy, and full of flavor. This lamb was not. This lamb was too rare. As you can see, it looks rare in the photo. Even though it was a beautiful quadrant of meat, it was not delicious as it could have been. The best plating of the night (look at that fancy splatter pattern!) unfortunately resulted in being my least favorite course of the night. My pork had good flavor (anything grilled is awesome), but it was tough, chewy and I could only take one bite before relinquishing my knife for the next course. The goat cheese mousse tasted a lot like sour cream and was similar in texture. The grit cake was good, even though it was more of a mound than an actual cake--creamy in texture with smoky andouille and bits of shrimp, this was the best part of the plate. The three-pepper relish really was more of a chopped salad than a relish. Relish implies that it is of strong flavor to complement the dish but there was no bite of spicy/sour/pickled/brined vegetable. The Sriracha-goat cheese demi was tasty, not at all spicy or hot and melded well with my grits. The splatter of balsamic was a nice touch at the end as I ran my fork around the plate. During the last four dinners, I've noticed that plating is not consistent. Some portions are smaller/larger than others, sauces aren't applied in a uniform manner, and this worries me (just a tinytiny bit). At first, I thought it was just me. But last night confirmed my suspicions. 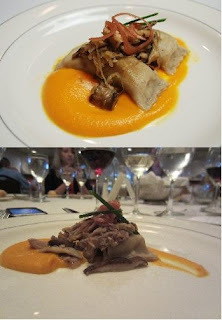 Case and point: The top photo (below) is from Competition Dining. and the bottom photo is from my camera. No, I am not a professional photographer, but my meal looks different from the one presented on the official website and I hope they didn't taste different. Granted, this is just one example of something I've noticed. A viable explanation of this could be something Jimmy Crippen disclosed last evening: The chefs in the back work side-by-side all afternoon, creating their dishes and when it's time to plate--it's all hands on deck and both teams get on-line and help each other put out the food to us. It makes me feel good that there is camaraderie going down in the kitchen while we diners imagine both teams cutting eyes at one another and wishing ill-will of Top Chef proportions. I just wish my plate and others were similar in portion size and saucing. Okay, back to Battle Feta & Goat Cheese! The fourth course was my 2nd least favorite dish. It was as if two entrees were melded together and attempted to get married by an officiant named Beurre Blanc and used the feta vinaigrette as a witness . The ravioli (or raviolo, since there was only one) was one of the best parts of the plate. Sweet crab with the tangy goat cheese swirled in the beurre blanc and dabbed in the tomato jam... Mmm mmm mmm! Sadly, the veal was flavorless and the most flavorful part about it was the roasted mushrooms on top. The mushrooms were more of a ragù than anything else. The tomato jam was bright and sweet and picked up the rest of the dish. The asparagus didn't add much to the plate, except color, but they were cooked well. The feta vinaigrette just sat there and seemed to be an afterthought. The penultimate course was a creatively rolled cheesecake that forced us diners to use our hands and get into the dessert plate with gusto. A few attempted to eat the crispy rolls with knives and forks, but they failed. This was not a knife & fork dish. The rosemary crumble was something akin to elegantly prepared Grape Nuts and got stuck in my teeth. This part I did not like. At all. Rosemary has a tendency to be strong in flavor and caramel walks a fine line between flavorful and burnt. The rosemary was so subtle, I wouldn't have been able to detect it had I not been told it was there; The caramel must have referred to caramelization, because I didn't taste much of that either. The Cheerwine gastrique was expertly executed, imparting lots of cherry flavor and tang to the dish. The semifreddo was deliciously creamy and silken, almost unctuous. The final course of chocolate cake looked very similar to the fifth course of Battle Cheerwine. For a few short seconds, I had to do a double take between the display screen of ingredients and my plate. In contrast, this cake, tasted like a devil's food cake and was just as airy and light. The star of the show was the feta ice cream: rife with chunks of feta surrounded by the rich, creamy ice cream and bits of salty, sweet CANDIED BACON! Bacon is meat candy and that's exactly what it represented in this dish. I will have to say: some of my bacon was burnt and unpleasant, but the concept was still executed well. Chef George C Neal of 1618 Seafood Grille! To see a breakdown of scores, please visit Competition Dining. Round 2 of the Semifinals has been set and Chef George will meet Chef Wheeler of Southern Lights Bistro on September 6! Winston-Salem has yet to win a battle. Does Greensboro have home court advantage? Are Winston dwellers not coming to support our restaurants because "the drive is too far"? Or are Greensboro chefs really superior and are blowing us out of the water? What do you think, diners?